Superbells Doubles, of the Calibrachoa family are part of the new series of Superbells from our breeders in Japan. With fully double flowers, massed on the plant for many months of the year they take their place as some of the proven stars of the garden. They flower through the warm summer days of early spring right through until late autumn. Flowers are held clear of the plant making the effect striking, like all the new Superbells. The Doubles in the series have been selected by the breeders for their large clear coloured flowers and strong summer performance. Abundant flowering occurs all through the warmer months of the year on fresh cascading growth. No dead heading is necessary. The growth habits of the Superbells Doubles give good stature when planted alone or in combinations. They will grow best in full sun. As they all grow to similar heights and widths they are well suited to containers, baskets, on patios or in the garden. With their distinctive fully double flowers these plants from our Japanese breeder will work well for you in your garden. The first plants of Calibrachoa were taxonomically described only in 1989, not long ago. The first cultivars were released to market in 1992. The original plants were found in coastal areas clinging to rocks and surviving in some pretty harsh conditions. 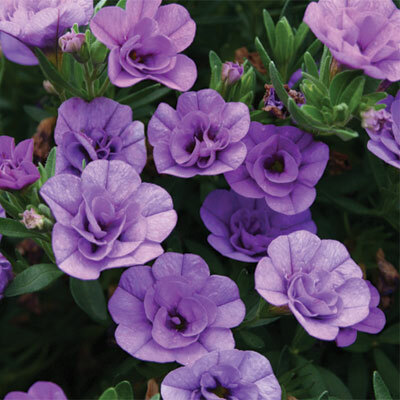 They so much resembled Petunias that they were originally referred to as “Seashore petunias”. The family tree of this genus reaches deep into South America, almost all species found in either Argentina, Brazil or Uruguay. There are 25 known species. Breeding is complex as all varieties are not compatible.